This is a little off-topic for me but I had to share about eggs. Diana, a colleague of mine, raises ducks and chickens and sells $3.00 dozens to folks in our office. Seeing the carton labeled, "Leigh," in the break room refrigerator is pretty much the highlight of my week and I always pop it open to admire the rows of colorful, mismatched pearls. You never know what you're going to get, and, as you can see in the picture, it's usually a mixed bag. The chickens lay brown, green and white eggs and the ducks are responsible for those giant guys on the right, which are excellent for breakfast or baking. The yolks are larger and richer and the flavor is just out of this world. People have a tendency to flinch at the thought of anything other than a traditional chicken's egg but that really shouldn't be the case. While on a baking jag a few weeks ago, I ran out of Diana's eggs and had to buy a dozen from the supermarket for everyday use. It had been a chunk of time since I'd tasted a corporate egg and was absolutely astounded by how flavorless they were. I made myself a fried egg sandwich, bit into it, and tasted no egg at all. The texture was tough and foreign and the yolk that ran out was a pale, pathetic yellow (not the robust orange to which I'd grown accustomed.) It was disappointing, but not at all surprising. We've been force-fed a factory product for so long that we, as a culture, don't even know what eggs are supposed to taste like. That's tragic, and I won't stand for it. So even if you aren't lucky enough to work with a free-range farmer, make it a point to go to Honest Weight, or a farmer's market, and try a local egg. You're gonna die, I promise, and you, like me, will never want to go back. P.S. Diana also tells me all sorts of cute stories about the birds, my favorite being how they are free to fly out of their enclosure at any time, which they do. They haven't yet wrapped their minds around flying back in, though, and always queue up in an orderly fashion at the gate, waiting to be let in. They could easily escape, but choose to head home. I love that. Happy chickens equal yummy eggs. Mmmm I'm coming over for eggs one of these days! You just made my mouth water for something I didn't even know I was missing.. not that I eat eggs too often, but that might change now! Not only do they taste better, but in general local eggs are cruelty free - or at the very least 1000x more humane than their conventional cousins. Industrial egg production is appalling. I couldn't believe that someone thought the new Dunkin' Donuts egg sandwich was "DELICIOUS!!!" That puck of yellow protein doesn't deserve to be called an egg. Blech. Daniel, I absolutely agree. I've done a lot of research into large-scale, "free-range," egg production and the standards are nowhere near stringent enough to make me feel comfortable making that choice. Local is the way to go, even above organic, in my opinion. I love that DD comment. If you truly believe that is, "DELICIOUS!!!" you deserve all the garbage you consume. I had ABSOLUTELY no idea about this. I am eggnorant. Ha - but seriously...I love eggs and will now make it my goal to try a new egg. Like I tried escargot. I have to say, to me, a huge plus to living upstate is the access and reasonable price of local eggs. I can pick up a dozen from the creamery for three bucks! They go for 5-7 dollars at NYC farmer's markets. Dude, that sounds awesome. 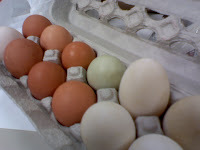 I really wanted to get some multi-fowl eggs from one of the farmers markets around here, but they were $5-6 a dozen, a little steep for me. $3 from your co-worker sounds quite eggcellent!